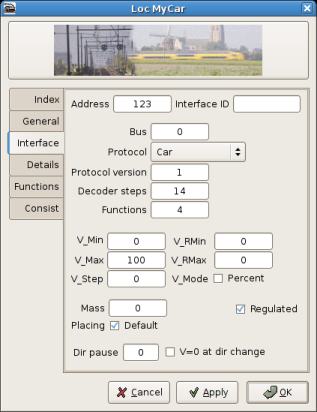 Dinamo/MCC is a system to realistically control the speed and lights of scale model cars. Every vehicle has an addressable decoder. This decoder controls the motor, lights and other available functions of the car. The basic concept is simple to implement and easy to understand and identical to the operation of digital trains, except for the strange rubber wheels and the battery. Since there is no electrical contact between the road and the vehicle, communication is wireless. The road is converted into a transmission system, simply by adding 2 inexpensive copper wires just below the surface and thus invisible. The decoder in the car picks up the signals from the road and can be controlled by the PC instantaneously. The road is also equipped with detectors. If placed in the right spot reed switches are triggered by the steering magnet. The PC receives the detector messages and “knows” where the cars are at that moment in time. Integrated cruise control with a PID regulator, this enables the car to drive very slowly. Choose the Car for sending the Car speed and function commands. Is used as the acceleration parameter.